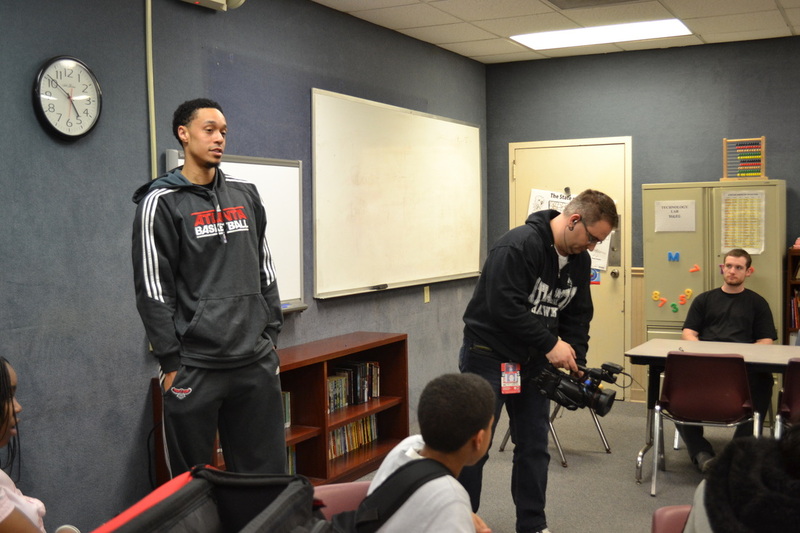 Ever heard of the NBA Cares movement? Even before it became a league-wide initiative, players were helping the community because it’s just the right thing to do. 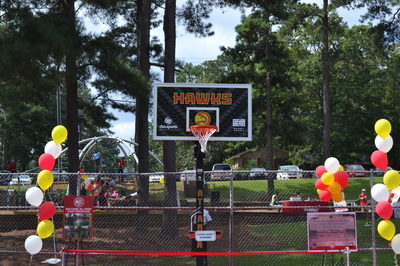 We will tell you about how the Hawks organization has played a part in the community and more. The Atlanta Hawks hosted their annual Casino Night at Opera in Atlanta, GA, on Sunday, March 10, 2013. 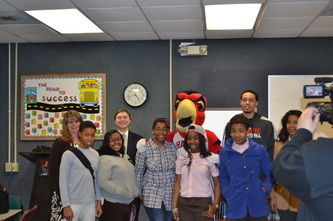 John Jenkins, Mike Scott, and Johan Petro joined three different groups of students on February 21 to head the Stock Market Simulation Game hosted by Bank of America Merrill Lynch, The Salvation Army Boys & Girls Club of Greater Atlanta, the Georgia Council on Economic Education and the Atlanta Hawks.The teams are made up of 6th, 7th, and 8th graders and involve roughly 35 participants from Bellwood, Fuqua and Peachcrest Boys & Girls Clubs. 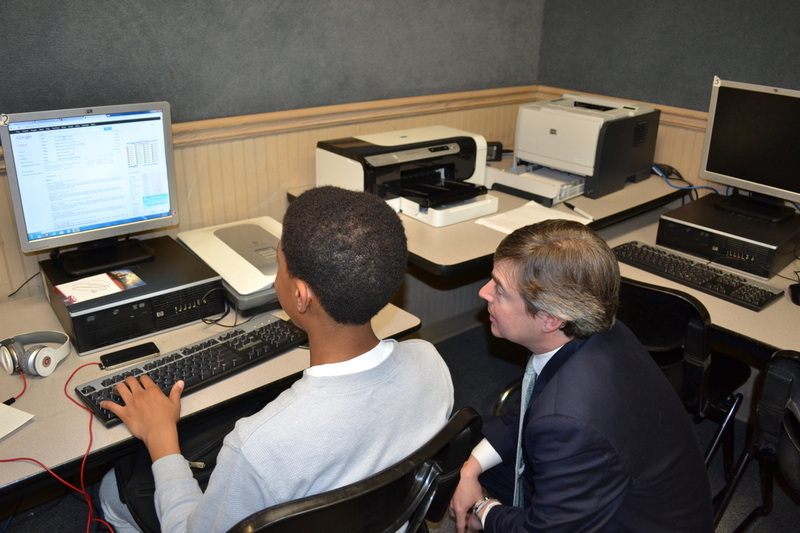 The students will compete using a simulated investment game to invest in the stock market. 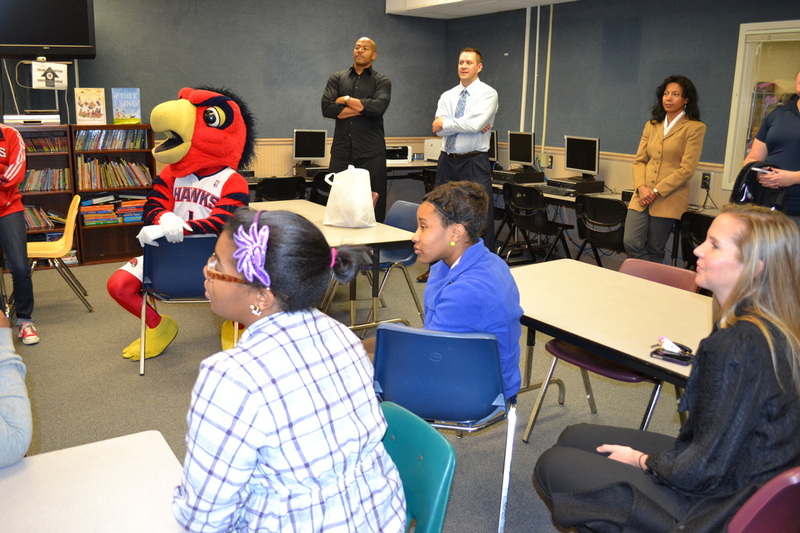 The goal of the challenge is to teach children about the importance of financial investments and economics. In addition, the Atlanta Hawks Foundation is donating $2,500 to each participating Club. Merrill Lynch volunteers will mentor and coach the students who are given a hypothetical $100,000 in common stocks on the New York and American Stock Exchanges and NASDAQ to invest. The winners of the 10-week competition with the most profitable investments are to receive on-court recognition during halftime at the Hawks vs. Milwaukee Bucks game on April 12. 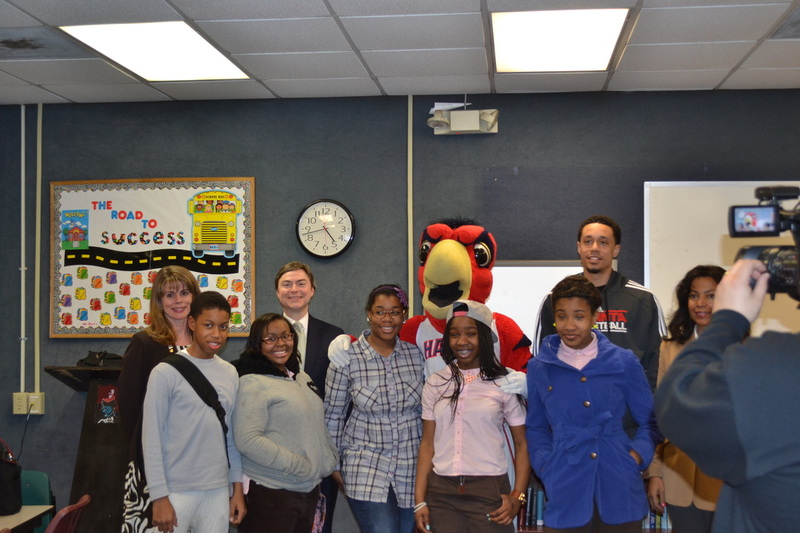 John met with eight student participants in addition to representatives from Merrill Lynch, The Salvation Army and more. 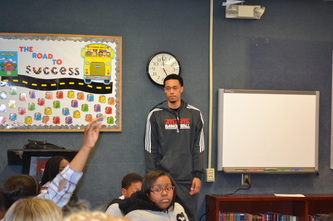 After an introduction, the floor was opened to the students (and adults) for a Q+A session and John autographed a Jenkins jersey to donate to the Club. Questions ranged from informative when John was asked about his spending habits and his stance on education to fun when John was asked how much money he's spent on Krispy Kreme donuts (rookie duties) and who he would choose between Beyonce or Rihanna. 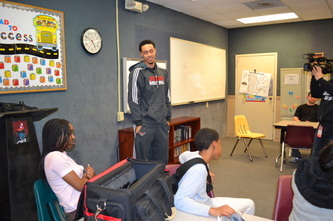 John enforced how important education is, saying that he is working on finishing his degree at Vanderbilt, with a 20-page paper on his rookie year due in April. Not spending his money frivolously, John recounted that one of his major purchases was a car for mom, and aims to put his sister through college. 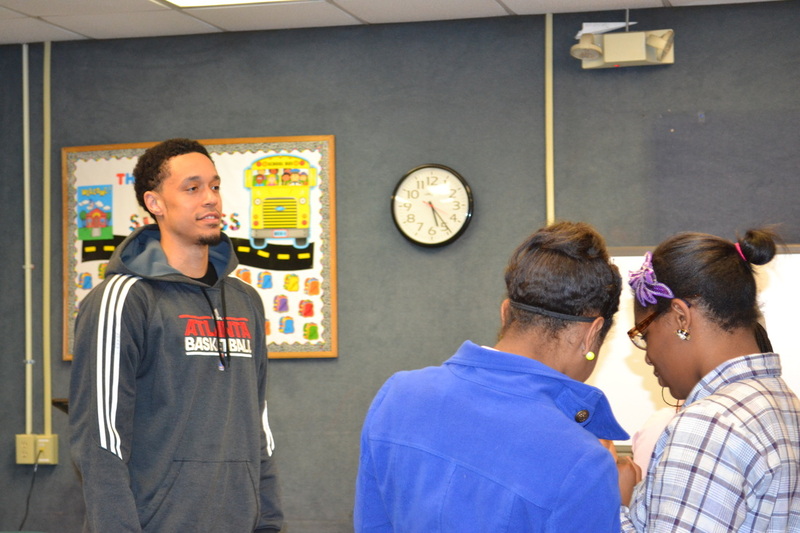 Students and adults alike were impressed by John's maturity and planning as there are common misconceptions that young adults tend to be careless with their funds. 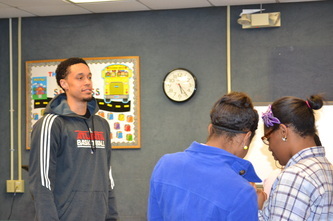 Following the questions, John signed more autographs and took photographs with everyone. He also sat down with a participant to check on the stock market trends. The visit ended with John, Harry the Hawk, participants and representatives from all organizations coming together for a photograph. 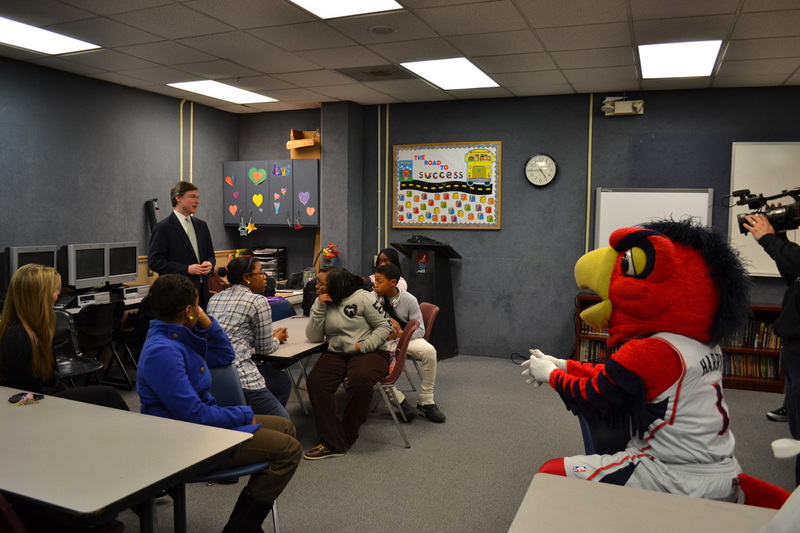 On Tuesday, January 29, 2013, the Atlanta Hawks joined NBA Fit Live Healthy Week to present a free one-hour yoga class to children from C.H.O.I.C.E.S. (Center for Helping Obesity In Children End Successfully). The hosts of this event were none other than Ivan Johnson and Zaza Pachulia. 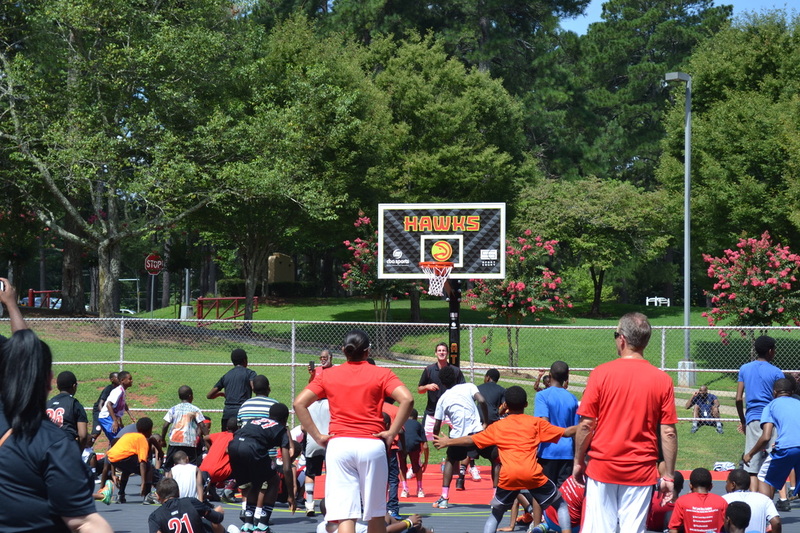 The children enjoyed instruction from the Hawks own team yoga instructor, received free NBA Fit and Hawks paraphernalia, and a Q&A session with the two NBA players. The children were delighted in seeing the Hawks' big men gracefully (and not so gracefully) pull off some of the more difficult yoga poses. 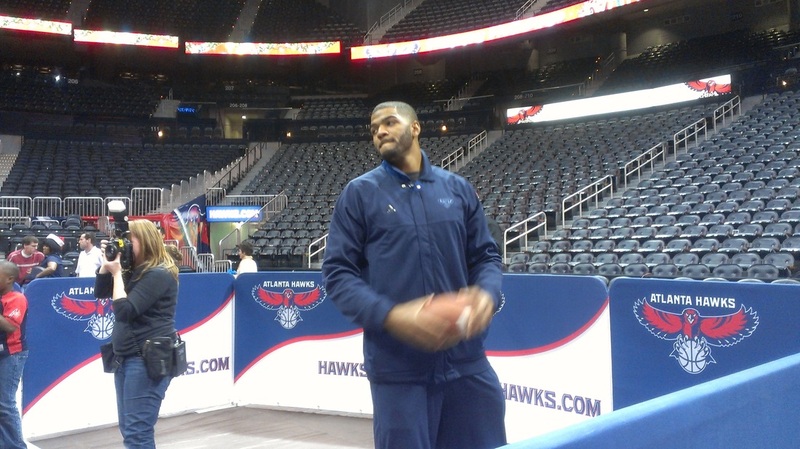 On December 23rd, Josh Smith treated 20 children from City of Refuge to a fun-filled afternoon at Dave & Buster's. 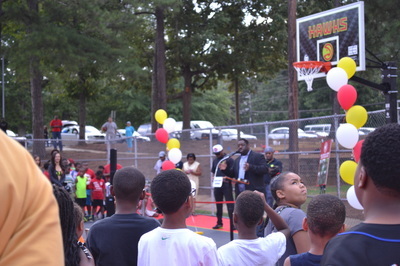 As an Atlanta native himself, it brings immense joy to J-Smoove to give back to the same community that both raised him and supports him to this day. He picked up the group of children from City of Refuge at 2 p.m. and transported them to Dave & Busters where they enjoyed some great food and lots of fun games. What else could a kid possibly ask for this time of year? City of Refuge is a non-profit organization dedicated to sustaining the community through various community development efforts. Their mission is "to bring strength, hope, and light to Atlanta's last, lost, and least." "Look! Look!" 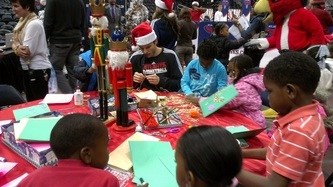 exclaimed an excited Zaza Pachulia as he showed Johan Petro a masterpiece at the arts and crafts area. 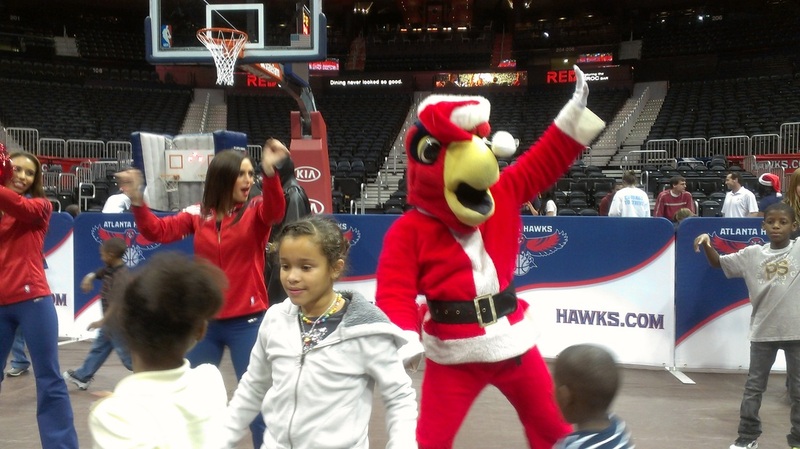 The Atlanta Hawks hosted approximately 200 children from local area nonprofits (Chris Kids, LaAmistad, My Sister's House, and Safe House Outreach) for the "Hawks Holiday Hoopla" event at Philips Arena on Friday, December 14 from 5:30pm to 7:30pm. There were games for the children to play, an obstacle course, a dance floor, a photograph station and more. All of the players mingled and played with the kids and staff while the coaches made their rounds talking, signing autographs and taking photos. "This right here is my favorite station," declared Ivan Johnson as he stood by the shooting competition. Ivan, who was so enthralled by young children attempting fadeaway jumpers, hadn't had much time to experience all that the event had to offer. There was just that much going on. Lou Williams and Mike Scott were all over the place, with Lou playing musical chairs and joking with a young man about his choice to wear a Chicago Bulls snapback hat. "You thought you'd be able to hit that shot with that cap on, didn't you?!" shouted Lou as the shot banged against the rim. The young man laughed and jumped back in line to prove Lou wrong. Josh Smith showed to be the life of the party as he got on the dance floor to do "The Wobble" with the kids, Harry the Hawk, the Atlanta Hawks cheerleaders, and Batman. Yes, even the masked superhero made a special appearance at the holiday event and was an instant hit with children and adults alike. 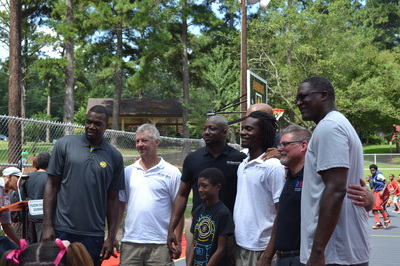 Although the players and coaches were scheduled to leave at 6:30pm, a few stayed around a little longer to play with the children and take photographs. 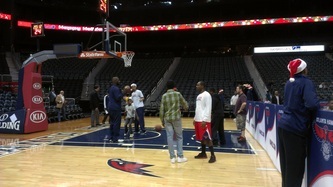 Jeff Teague took over Josh's role as quarterback when he began playing catch with some young girls and boys. 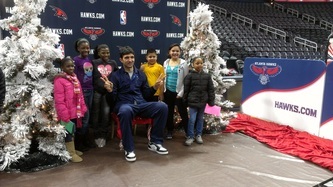 Zaza wanted to make sure everyone was able to get their pictures taken with him. 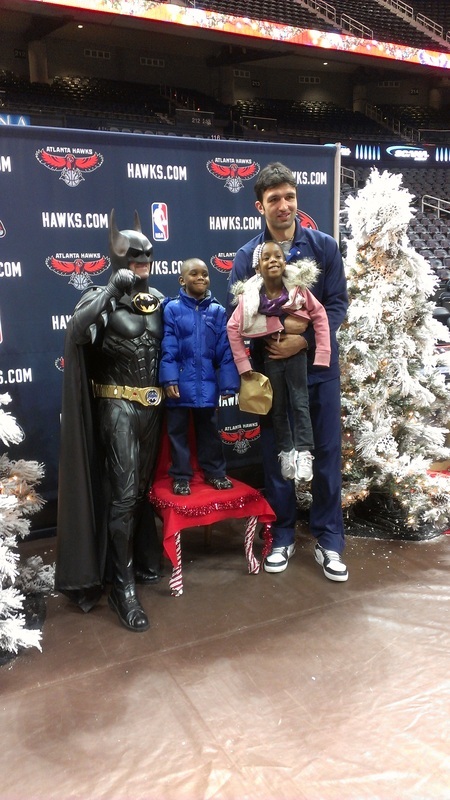 He was the last player to leave as he posed with Batman and other children to ensure their happiness. Eight-year-old Maria had so much fun at the event, she remarked she would attend again in a heartbeat. When asked what impressed her the most about the players, Maria exclaimed, "Taking a picture with them!" 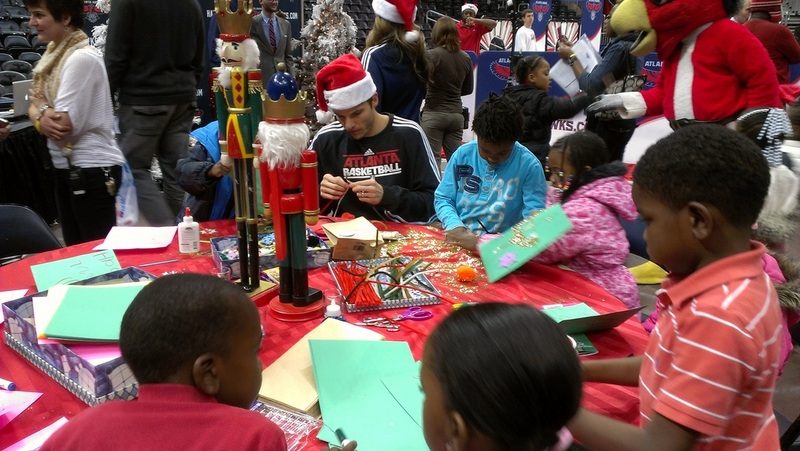 She enjoyed the arts and crafts station more than anything, where Anthony Morrow, Kyle Korver, Zaza Pachulia, and Johan Petro were found. The event was a fun-filled success as the children didn't want to stop playing. They sat and dined on popcorn and drinks provided by the Hawks and said their goodbyes to all of the personnel. This Hawks team has not only been a hit on the court but their personalities were a slam dunk as they met with the smallest of fans at the holiday event. Everett Glenn, CEO and founder of The National Sports Authority (http://www.nationalsportsauthority.org/), touched on his observations of young black athletes ending up in a world they know nothing about often with people attempting to take advantage of them. 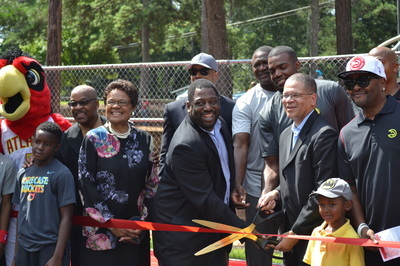 The National Sports Authority has the aim to teach young athletes of color the ins and outs of the sports industry to prevent bankruptcy and provide useful life lessons and connections. Mike Scott's first event with NSA was a VIP Networking Reception/Meet and Greet on 11/25 from 5-8pm that featured food, drinks and various faces of Atlanta businesses. Atlanta City Councilman Michael Julian Bond was on hand as well as many black professionals from the Atlanta area such as a MetLife board member and a black architect who helped create some of the Olympic and airport structures. Mike's teammate, Anthony Tolliver, showed support by stopping by as well as actor, Tommy Ford, who delighted individuals with his natural wit. The event took place at The Green Room: Actor's Lounge and co-owner, Shannon Nash, was on hand to graciously open her establishment for the event. Sports Entertainment Manager, Elise Hillman, also contributed to the coordination of the event and maintains Mike's media relations and events. 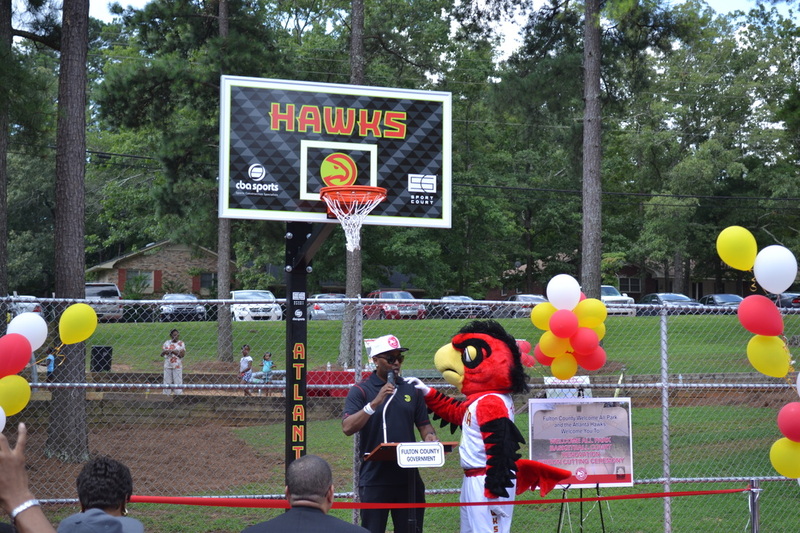 The Hawks foundation donated $50,000 to the city of Atlanta for the purpose of renovating all four basketball courts in the Old Fourth Ward's Central Park. 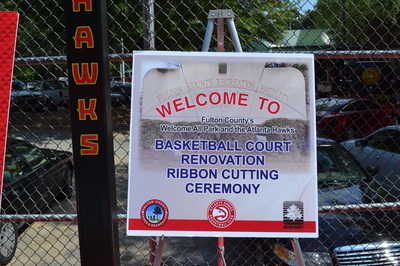 Renovation began in late September and was completed at the end of October. 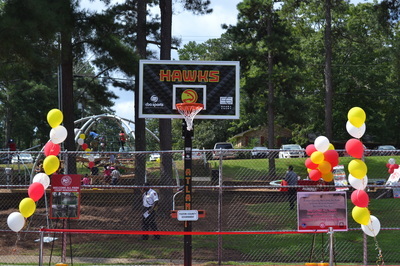 This renovation serves as the first investment in the neighborhood park in more than a decade. The donation from the Hawks foundation is in support of Atlanta City Councilmember Kwanzaa Hall's Year of Boulevard initiative which aims to provide Council District 2's Boulevard corridor with "public safety improvements, social and economic development opportunities and youth programming. " 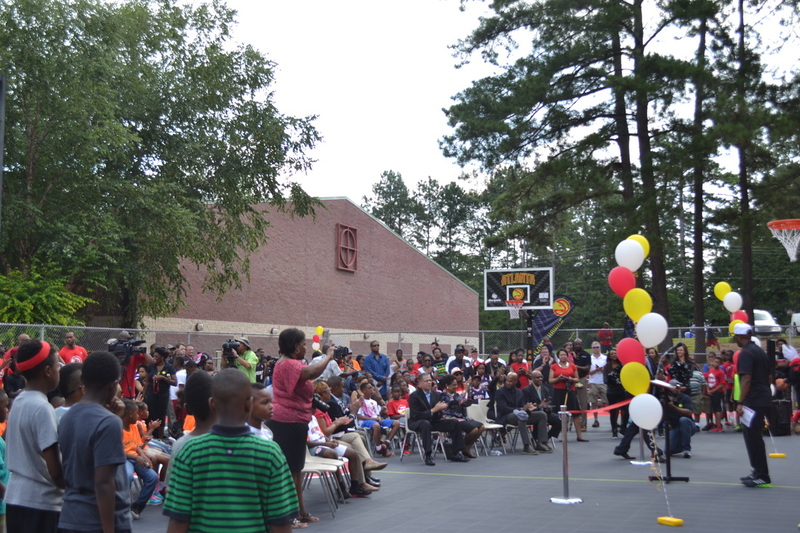 These basketball courts provide over 500 youths with after school programming and summer league basketball. Each court received a new makeover complete with new paving, painting, backboards and rims branded with the Atlanta Hawks logo. 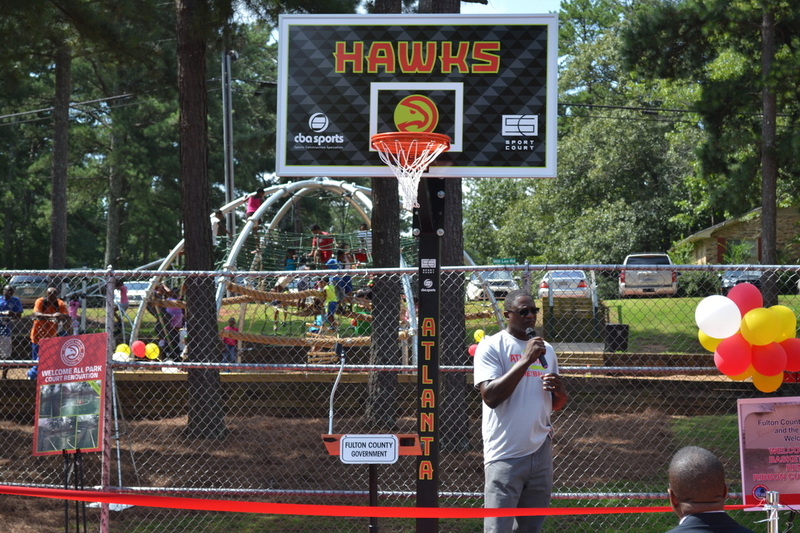 This gesture by the Hawks Foundation is also part of NBA Cares week which takes place from Oct. 22-29. NBA Cares Week is led by players, coaches, legends, and executives giving back to their respective communities through education, health and wellness and hands-on service. 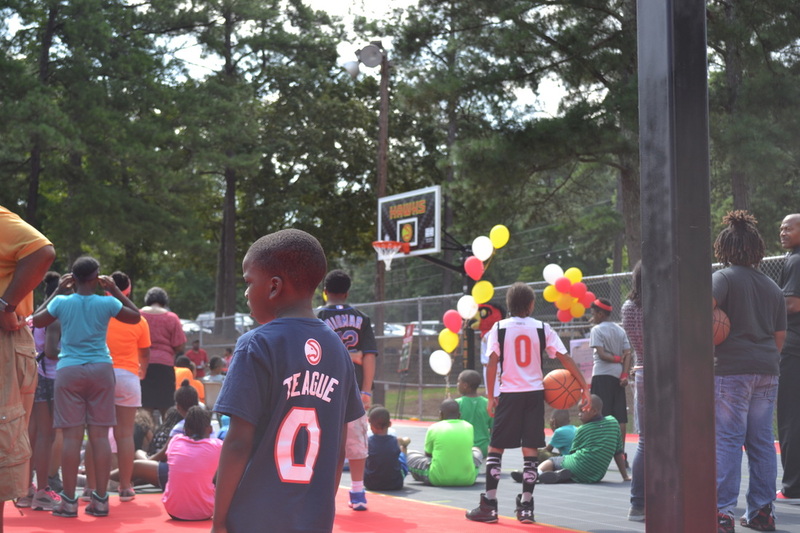 Check out some photos below taken by Jameelah J (@JameelahJNBA) and Latrece E (@Atllaev)! 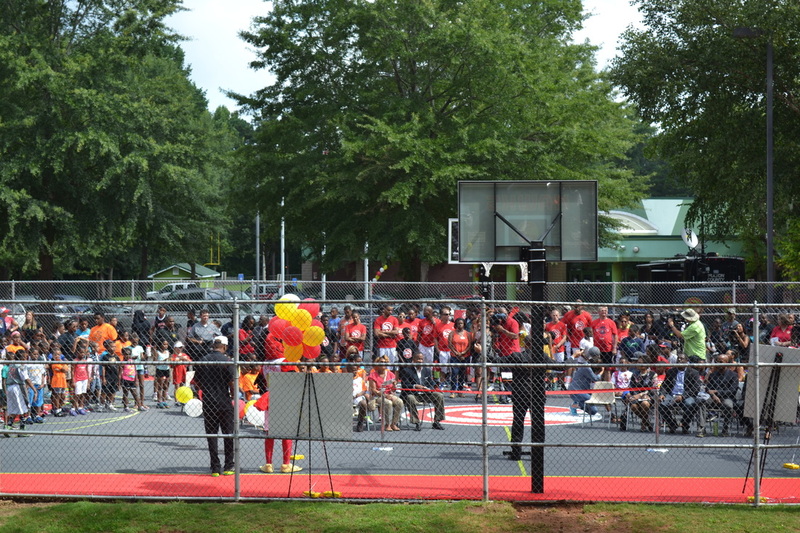 On Friday, October 23rd Lou Williams and the Atlanta Hawks surprised the students of Gwinnett High School with a pep rally and open scrimmage. "Students and teachers from the high school and neighboring Britt Elementary School were invited to attend an academic rally to celebrate their high achievement during this school year when Principal Eric Thigpen and South Gwinnett alum and new Hawks guard Lou Williams announced the Hawks were taking over. 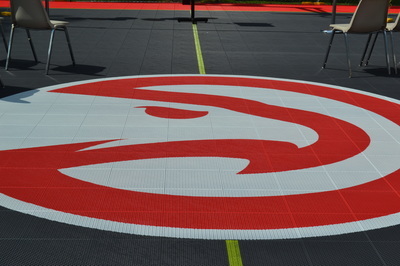 The Voice of the Hawks' Steve Holman, Harry the Hawk and the Hawks Cheerleaders entertained the crowd, giving out rally towels and performing dance routines as Head Coach Larry Drew took the team through practice before closing with a special scrimmage just for those in attendance." You can check out the official press release for yourself as well as a photo gallery from the event. Video highlights can be found here. 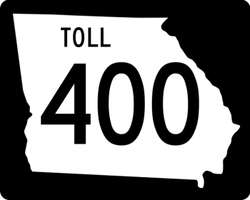 The Atlanta Hawks will pay everyone's toll on GA 400 from 7-9AM on Wednesday, October 24th as a way to say thank you to the fans and the community of Atlanta.
" 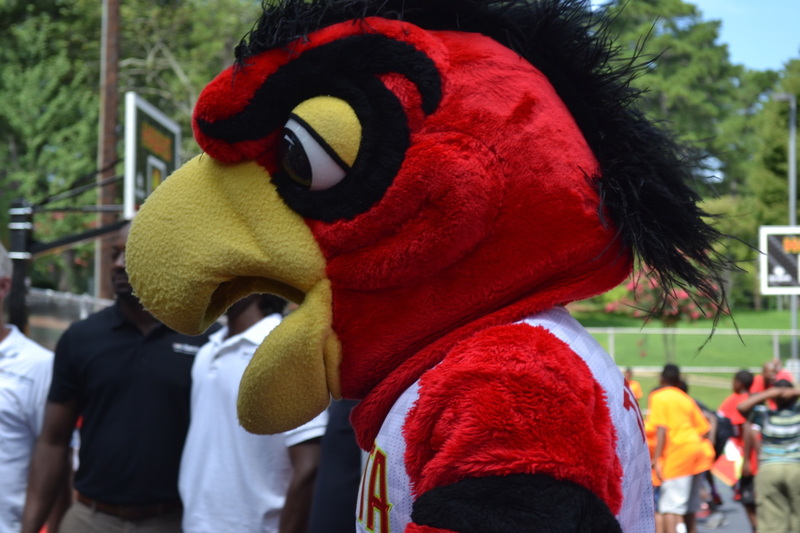 In addition to the paid toll sponsorship, Harry the Hawk and the Atlanta Hawks Cheerleaders will be at the tolls handing out magnet game schedules, Hawks branded air fresheners and $50 Hawks Cards good towards the purchase of tickets to Hawks home games in November and December 2012." 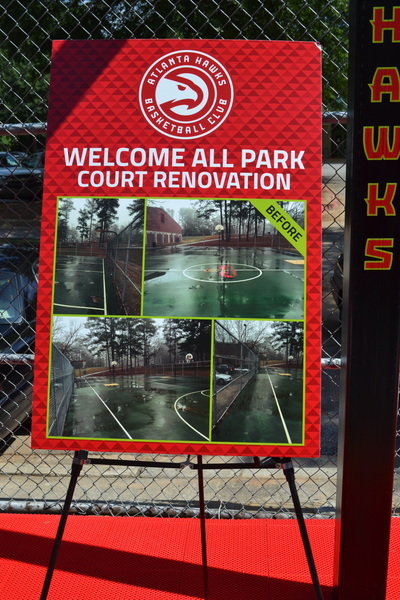 Check out the press release from the Atlanta Hawks about Wednesday's free gesture. 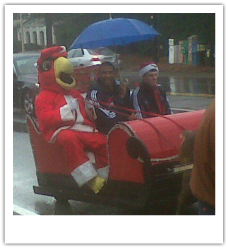 The Atlanta Hawks painted the town red this year at the Varsity in downtown Atlanta. Josh Smith, Zaza Pachulia, Anthony Morrow, Kyle Korver, DeShawn Stevenson, Anthony Tolliver, Mike Scott, James Anderson and Damion Jones took over the famous Atlanta establishment on Friday, October 12th by manning the registers and serving customers for a few hours of the day. Customers who purchased a combo meal at any point throughout the day were able to receive a free small frosty orange courtesy of the hometown NBA team. 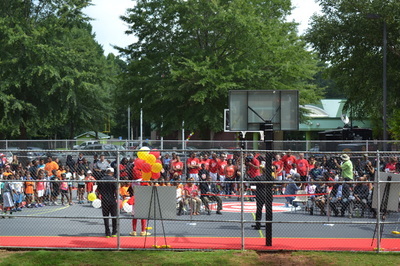 Several fans came out to take advantage of the event and to see their favorite players up close and personal. Paint the Town is a great Hawks event that takes place every year allowing the fans to interact with the players. It is one of the best times to chat with your favorite player, get an autograph and take photos. Read about one fan's great time had as his son met Zaza and Jamal Crawford at the "Paint the Town Red" event in the past. Be sure to check out the press release from this year's event as well as the fun videos highlighting the successful takeover. 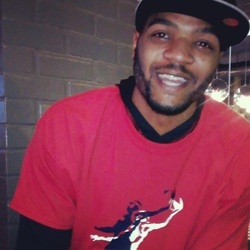 Our personal favorite is the Josh Smith Cam! Photos from this year's Paint the Town can be found here. 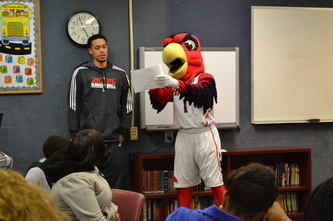 On February 1st, the Hawks hosted a cooking class for 25 students at Bethune Elementary School as part of NBA Fit Live. Hawks Head Chef Bradley Rouse was on hand with Dominique Wilkins and Marvin Williams to lead an interactive and hands-on cooking session with the students. Bethune Elementary was selected as the recipient for the cooking class due to their dedication to healthy eating and fitness. 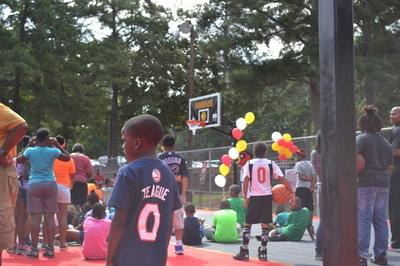 NBA Fit is a league-wide initiative that encourages physical activity and healthy living for children and families. On Wednesday, Dec. 21st the Atlanta Hawks surprised patients at Children's Healthcare of Atlanta at Egleston. Al Horford, Zaza Pachulia, Jerry Stackhouse, Kirk Hinrich, Jason Collins, and Magnum Rolle brought the holidays to the hospital by delivering toys via reindeer and sleigh to every patient. 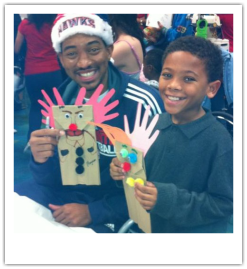 In addition to receiving toys, patients and their families were invited to a holiday party where they can participate in arts and crafts, play games, and take photos with Hawks players and Harry the Hawk. 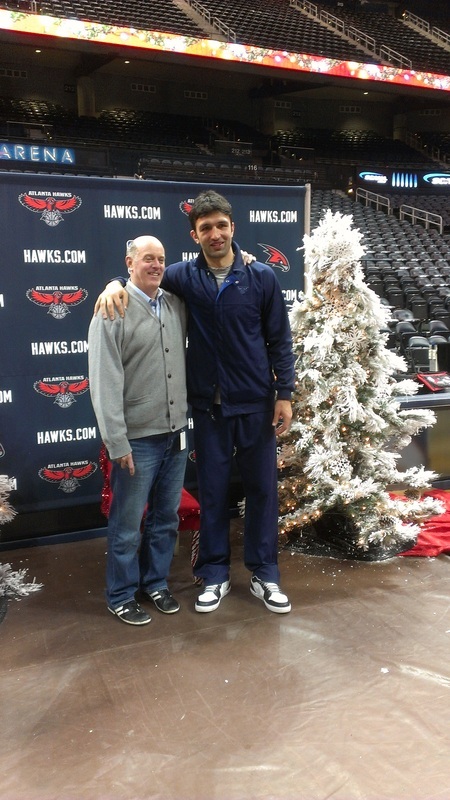 For those patients who are unable to attend the holiday party, Hawks players will conduct one-on-one room visits. 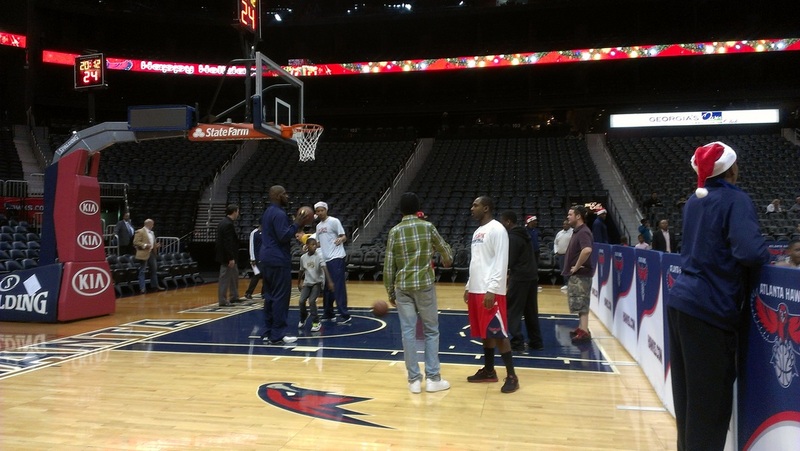 On Dec. 21st, Joe Johnson took some kids from Atlanta Mission shopping for Christmas. 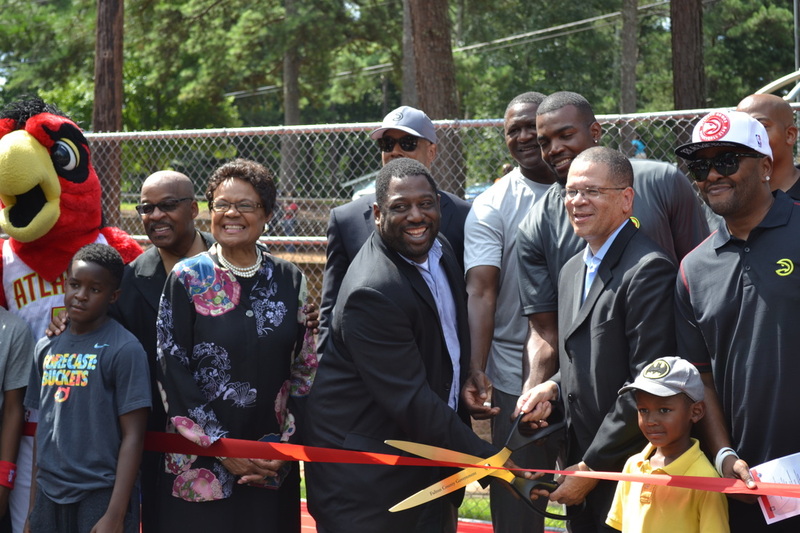 Atlanta Mission is a ministry devoted to providing emergency shelter, residential discipleship, job attainment, and transitional housing to men, women, and children every day. Here's a picture of the happy kids with Joe! 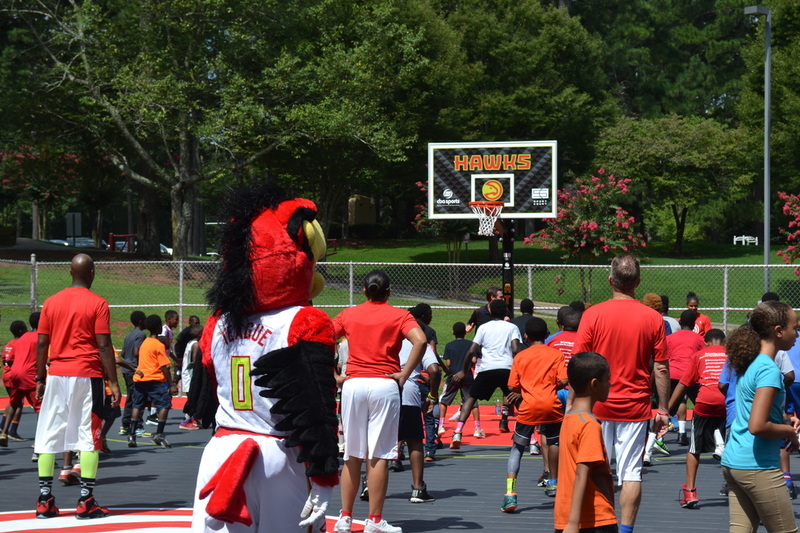 The Hawks have announced that they are offering kids under the age of 16 free admission to the preseason finale against the Charlotte Bobcats on Thursday, Dec. 22nd. All parents or guardians have to do is show up to the Philips Arena Box Office to receive up to four free kids tickets (for each paying adult). Be sure to get there early! Tip-Off is at 7:30pm. 11/22: "The Home Team" teamed up with Seattle City Councilmember Bruce Harrell and Mayor Mike McGinn to share the joy of Thanksgiving with others. The Home Team consists of Seattle native NBA players Brandon Roy, Jamal Crawford, Will Conroy, Isaiah Thomas and Spencer Hawes. Seahawk Player Kam Chanceller also joined the guys. With the help of Safeway, the Home Team purchased 2,000 turkeys to give to 2,000 families who signed up at the local community center. The event was a huge success and I'm sure the players made an impact that will go much farther than Thanksgiving Day for those families. 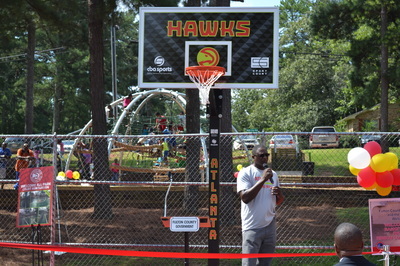 During the NBA Lockout, Damien Wilkins took it upon himself to bring basketball back to Atlanta. He hosted an exhibition game for fans to come out with amazingly cheap ticket prices and headline players. 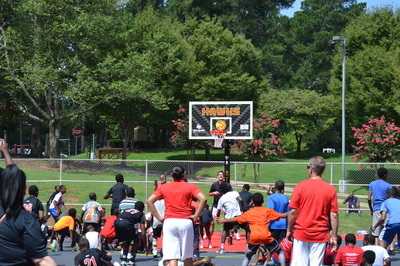 Damien invited the following players to participate in the Monster Slam Exhibition game: Josh Smith, Joe Johnson, Jeff Teague, Anthony Morrow, Chris Wilcox, Derrick Favors, James Harden, Jarrett Jack, Jeff Green, Jonny Flynn, Jordan Crawford, Lou Williams, Mike Beasley, Rudy Gay, Russell Westbrook, Shannon Brown, and Trey Thompkins. The coaches for each team were Nene Leakes from Real Housewives of Atlanta and platinum selling producer, Drumma Boy. Drumma Boy's squad walked away with the victory after edging out Leakes' team 141-140. The game had a great turnout and it was all for charity. Several kids from the Boys & Girls Club were in attendance at the game and all proceeds went to the Boys & Girls Club of America. You can see highlights of Damien's Monster Slam Exhibition on our Multimedia page during the month of November! Josh Powell and the 21 Reasons to Give Foundation treated 150 chronically ill and injured children and their families to a magical night at Zoo Atlanta on June 17, 2011. Dreamnight consists of a guided tour, animal encounters, themed Dreamnight train rides, arts and crafts, a performance by Laughing Pizza, sounds from Little Beat Music, meet and greet with costume characters, and customized "Swag Bags" full of goodies. 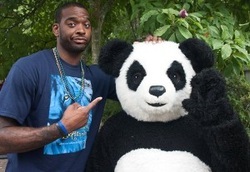 Josh Powell told Zoo Atlanta: "I am blessed and honored to have been a part of this amazing event. To give this VIP experience to an amazing group of children makes it worthwhile. 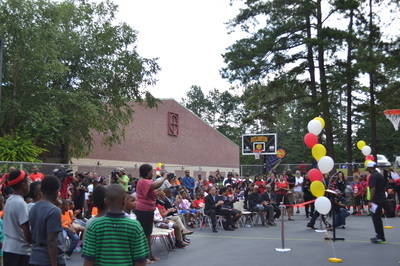 I would like to thank the children, Keisha Hines, Zoo Atlanta, and Moment 4 Life PR." 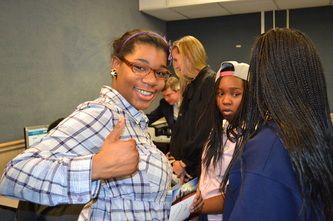 Featured below is a lighthearted moment from the event.